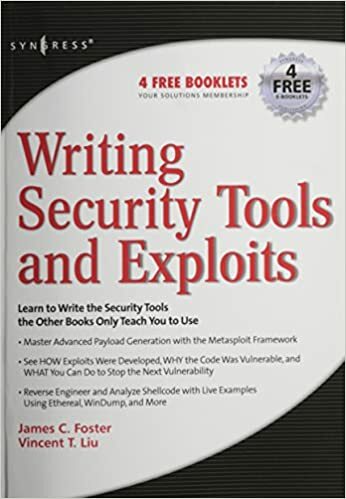 Writing Security Tools and Exploits will be the foremost authority on vulnerability and security code and will serve as the premier educational reference for security professionals and software developers. The book will have over 600 pages of dedicated exploit, vulnerability, and tool code with corresponding instruction. Unlike other security and programming books that dedicate hundreds of pages to architecture and theory based flaws and exploits, this book will dive right into deep code analysis. Previously undisclosed security research in combination with superior programming techniques will be included in both the Local and Remote Code sections of the book. The book will be accompanied with a companion Web site containing both commented and uncommented versions of the source code examples presented throughout the book. In addition to the book source code, the CD will also contain a copy of the author-developed Hacker Code Library v1.0. The Hacker Code Library will include multiple attack classes and functions that can be utilized to quickly create security programs and scripts. These classes and functions will simplify exploit and vulnerability tool development to an extent never before possible with publicly available software. The SANS Institute maintains a list of the “Top 10 Software Vulnerabilities.” At the current time, over half of these vulnerabilities are exploitable by Buffer Overflow attacks, making this class of attack one of the most common and most dangerous weapon used by malicious attackers. This is the first book specifically aimed at detecting, exploiting, and preventing the most common and dangerous attacks.